Update December 2017: a Royal Commission of a different feather is announced. Update June-September 2016: more from Humphrey McQueen and others. Update 9 April 2016: updated article on Pearls and Irritation website. Opposition Leader Shorten has called for a Royal Commission into Australia’s banking industry, following scandals about financial advice and market manipulation. This issue will presumably be caught up in an election campaign. 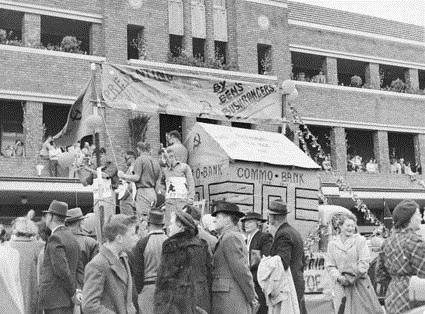 Meanwhile, it is worth looking at Labor’s history in the banking field, particularly the attempt to nationalise the banks in 1947 (which was more to do with fears of a new depression than with ideology), the previous Royal Commission on banking in the 1930s, in which later treasurer and prime minister, Ben Chifley, was a leading player, and earlier fulminations against the ‘Money Power’. A good way into this is through our post of late 2014 which leads to a longer article about Labor and banking, with particular reference to the 1930s and 1940s. There are cross-references to an important report by the Australia Institute, to the Murray Report and to a remark in 2012 by the International Monetary Fund that Australia’s banking system is the most concentrated in the world. Of course, the degree of concentration relates directly to the feasibility of cartel arrangements, limitations on competition and, ultimately, damage to the consumer. The opposition to bank nationalisation in the 1940s (led by the private banks and their employees) was for intensity perhaps second only in Australian history to the conscription battles of 1916-17. It was bound up with other opposition to the then government, weariness over war restrictions, partisan media involvement, and a nascent anti-Labor Opposition under Menzies. There is also material about banking in our long-running ‘Jauncey’s view’ column (scroll down or use our search engine under ‘O’Malley’) where Leslie Jauncey, author of an early book on banking, became close friends with King O’Malley, former Labor Minister and, by many accounts, the leading figure behind the establishment of the Commonwealth Bank in 1911.